there isn't much i need to say to lead this new blog off. i just figured it would be better to separate all Michael's monthly numbers from his seasonal numbers up to the point in the year that we're at. it's fairly simple. my sections and number break downs will follow the same format as in my monthly blogs, though i have rearranged some things. so without further ado, here is how Michael is doing thus far in 2015.
so far in 2015, Michael has a total of 195 plate appearances and 169 at bats in 43 games (339.0 innings). in total, he has 51 hits, 21 extra base hits, 30 singles, 17 doubles, 4 home runs, 30 RBI, 3 sac flies, 21 runs, 23 walks, 2 intentional walks, 7 stolen bases (2nd), 4 GIDP, 13 strikeouts (8 swinging, 5 looking), 13 first at bat hits, 80 total bases, 77 left on base, 70 putouts, 5 assists, and 1 double play. Michael's .302 batting average is currently the 2nd highest on the team out of all the qualifying players. only Jason Kipnis is ahead of him right now, batting .340.
through May, Michael leads the team with 17 doubles, 30 RBI, 3 sac flies (tied), 2 intentional walks (tied), and a perfect 7-for-7 in stolen base attempts. he has the least amount of strikeouts among qualifying players as well, with 13.
he leads the outfielders with 5 assists and 1 double play (tied). he's 2nd with 70 putouts and 339.0 innings in the field. Michael is 2nd on the team with 51 hits, 21 extra base hits, 30 singles (tied), 23 walks, 7 stolen bases, 80 total bases, 169 at bats, .302 batting average, .473 SLG, and .853 OPS. in addition, he's 3rd with 21 runs (tied), 195 plate appearances, and .379 OBP. after looking through all my Michael statistics, i found that he set career highs for himself through May with 17 doubles, 23 walks, and a .379 OBP. he has a career low 13 strikeouts at this point also. Michael now has a total of 4 home runs for 2015, the same amount he hit in May because he hit all his homers so far in May. as expected, this is not even close to leading the team lol Brandon Moss boasts that title with his 8 home runs. Carlos Santana is 2nd with 6 homers and Jason Kipnis is 3rd with 5. Michael is currently tied for 4th with his 4 homers. Lonnie Chisenhall and Roberto Perez also have 4 bombs through 2 months. Michael became the team's RBI leader for the first time this season on May 20 when he got his 25th RBI of the season. he lost that bragging right during the May 22 game when he left 5 guys on base and Moss got 3 RBI for the night. it has since been a back and forth battle, but once Michael got his 29th RBI on May 28, he took over the team lead again and still has it going into June with 30 total RBI. so let's do an updated HR:RBI ratio. 2 of Michael's 30 RBI so far (6.7%) have come from his solo homers, while 6 of his 30 RBI (20%) have come from all 4 of his home runs. with Michael's back issue questionably lurking, he may not be hitting many more home runs this year, so it's good to see that he's getting the majority of his RBI in other ways besides going yard. Michael's K rate so far in 2015 is 6.7% (13 K/195 PA). he is currently the toughest hitter in the American League to strike out. he now averages 1 strikeout for every 15 plate appearances. --after the game on May 10, Michael had swung and missed 6 times in 347 pitches. to compare, Michael Bourn had swung and missed 35 times in 433 pitches and Detroit's Miguel Cabrera had swung and missed 43 times in 554 pitches. Michael also had just 1 swinging strikeout (and 2 looking) in 105 plate appearances at this point. his 3 total strikeouts put him at 1 K per 35 PA.
besides that, Michael still had a mere 3 strikeouts prior to the game. he did have 1 (swinging) strikeout during the game however, effectively changing all of the above swing and miss percentages. nevertheless, i wanted to mention them because those numbers remain outstanding regardless of how early in the year it was. right now a meager 13 of his total outs have come via strikeouts, meaning the majority of his outs are obviously coming from making contact with the ball. after 2 months of play, Michael has 62 groundouts versus 50 flyouts as well as 18 lineouts. Michael had a hit in 33 of the 43 games he's played thus far in 2015 and reached base safely in 37 games. he has 10 hitless games, but still reached base in 4 of those. Michael has 13 multi-hit games, 4 3+ hit games, and 5 multi-RBI games. he has at least 1 RBI in 25 games. in addition, he has 7 go-ahead hits and 9 go-ahead RBI. the Indians are now 20-23 in games that Michael played in and 4-3 in the games he sat out. Michael is currently batting .284 (27-for-95) against right-handed pitchers and .324 (24-for-74) against left-handed pitchers. these BAs did a total flip-flop from a month ago, as he's now hitting a lot better when facing lefties as opposed to righties. i'm still confident that things will even out more as the year continues. Michael's hitting .297 (22-for-74) with 13 RBI at home. he has 9 doubles and 3 home runs (12 extra base hits) at Progressive Field, along with 11 runs, 13 walks (1 intentional), 4 stolen bases, 4 strikeouts (2 swinging, 2 looking), and 40 total bases while playing 19 out of 24 total home games. he hit safely in 14 of the 19 home games he's played in and safely got on base in 16 of them. he has 5 hitless games at home, reaching base in 2.
meanwhile, Michael's hitting .305 (29-for-95) with 17 RBI away from Progressive Field. he has 8 doubles and 1 home run (9 extra base hits) on the road, along with 10 runs, 10 walks (1 intentional), 3 stolen bases, 4 GIDP, 9 strikeouts (6 swinging, 3 looking), and 40 total bases while playing 24 out of 26 total road games. he also hit safely in 19 of the 24 road games he's played and got on base safely in 21 of them. he has 5 hitless games away from home, reaching base in 2. Michael's ability to hit in the clutch has faltered a bit as of late. on May 8, he was the 2nd best clutch hitter in the American League, batting .476. he's now down to .314 (16-for-51) with runners in scoring position with 23 RBI through May. to be more specific, he's hitting .364 (4-for-11) with RISP and 0 outs, .400 (8-for-20) with RISP and 1 out, and .200 (4-for-20) with RISP and 2 outs. he seems to be struggling the most in those 2-out RISP situations. with 2 outs in an inning, Michael is currently batting .300 (18-for-60). he now has 4 doubles, 1 home run, 7 RBI, 12 walks, and 5 strikeouts (3 swinging, 2 looking). additionally, he's batting .373 (31-for-83) with 28 RBI with runners on base and .143 (1-for-7) with 3 RBI with bases loaded through May. the latter needs to improve. Michael has to figure out a way to deliver more when he comes to the plate with the ducks on the pond, and i think he'd agree. lastly, Michael's hitting just .233 (20-for-86) with the bases empty right now. he has 7 doubles, 2 home runs, and 7 walks, but i'd also like to see improvement there as well. vs. the Detroit Tigers, Michael's batting .529 (9-for-17) in 4 games. (he missed 2 games because he was out resting his back.) of his 9 hits, 3 are doubles, giving him 12 total bases. he also has 3 RBI, 3 runs, and 1 stolen base. in addition, he has 1 strikeout (looking), 3 men left on base, and 5 putouts in 32 innings in left field. vs. the Kansas City Royals, Michael's now batting .227 (5-for-22) in 6 games. he has 1 double and 1 home run to go along with 2 RBI, 4 runs, 4 walks, 1 stolen base, 1 GIDP, and 9 total bases. he's left 5 guys on base and recorded 10 putouts in 52 innings. from the beginning of 2014 up to the present, Michael is tied for 1st in the American League with 62 doubles. Detroit's Miguel Cabrera also has 62, while Houston's Jose Altuve is behind them with 57 doubles. this was initially brought to my attention on May 12 via Hoynsie, so now i will be keeping track of this for the rest of the year. comparing Michael's 2015 numbers so far to other qualifying players in the American League, he's ranked 1st in doubles (17), tied for 6th in sac flies (3), 10th in OBP (.379), and tied for 12th in extra base hits (21). once the AL batting leader, Michael has now fallen down to 15th with his current .302 BA. Texas' Prince Fielder currently leads the AL with his .359 BA. among qualifying outfielders in the American League, Michael is 1st in doubles, tied for 1st in sac flies, 4th in walks (23), tied for 4th in extra base hits and RBI (30), 5th in OBP (.379) and OPS (.853), tied for 5th in hits (51) and intentional walks (2), tied for 6th in batting average, and 8th in total bases (80) and SLG (.473). among qualifying left fielders in the American League, Michael ranks 1st in doubles, RBI, walks, BA, OBP, and OPS; tied for 1st in sac flies; 2nd in hits and extra base hits; 3rd in total bases and SLG; tied for 3rd in intentional walks and stolen bases (7); 5th in at bats (169) and plate appearances (195); tied for 6th in home runs (4); and tied for 7th in runs (21). among all major league left fielders, Michael is 1st in doubles; 2nd in walks; tied for 2nd in extra base hits and sac flies; 3rd in RBI, OBP, and OPS; 4th in BA; 5th in total bases and SLG; tied for 5th in hits; tied for 6th in intentional walks; tied for 7th in stolen bases; and 10th in plate appearances. among all major league outfielders, Michael ranks 1st in doubles, tied for 2nd in sac flies, tied for 7th in extra base hits, tied for 9th in RBI, and 10th in OPS. 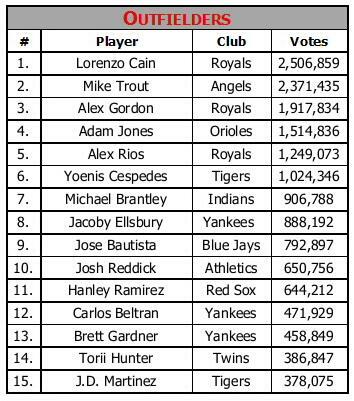 the first results of the AL All Star voting came out on May 26, and Michael ranked 9th out of 15 outfielders. he was the only Indians player to be on the first released results ballot. when the second results of the AL All Star voting came out on June 1, Michael had moved up to 7th. 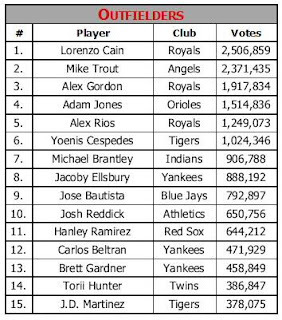 he is presently 1,011,046 votes behind the 3rd current starter, Kansas City's Alex Gordon. the next wave of results will be released on Monday, June 8. updates will also be provided on June 15, June 22, and June 29. voting ends on July 2. come on Michael fans! the Royals do not need 3 OFs in the top 5. VOTE FOR MICHAEL HERE! defensively, Michael continues to shine, owning a perfect 1.000 fielding percentage. now seeing time in both left and center field, Michael has a combined 70 putouts in 2015 so far. he also has 5 outfield assists and 1 double play. Michael's 4 assists in left field put him in a 2-way tie with Minnesota's Eduardo Escobar for 2nd most among AL left fielders. Detroit's Yoenis Cespedes has the most with 5, although it's worth mentioning that Cespedes has 3 errors in the field while Michael has none. Michael's 1 double play is ranked 1st along with 7 other AL left fielders right now as well. among all MLB left fielders, Michael's 4 assists rank tied for 3rd with Escobar, Atlanta's Jonny Gomes, and LA Dodgers' Scott Van Slyke. besides Cespedes, Chris Coghlan of the Chicago Cubs also has 5 assists. among all AL outfielders, Michael's 5 total assists rank tied for 4th (with 3 other players). among all MLB outfielders, Michael's 5 assists rank tied for 5th (with 5 other players). it's also noteworthy that Michael has now played 183 straight games without committing an error in the outfield. he's getting closer to breaking his previous franchise record of 247 games. now let's break down the numbers. i am going to document his 2015 #s through May, the 3rd spot #s, and the DH #s, as well as the left field #s, the center field #s, and overall outfield #s.
Michael played in 43 (of 50) games, 38 complete, in 2015 through May. he started and played left in 31 games, completing 25 of those games, appearing in 36 total. he was subbed out of 5 games after 36 innings; 1 game after 7 innings because the Indians were losing by a lot, and 4 games after 29 innings (7 innings/8 innings/8 innings/6 innings per game) because the Indians were winning a blowout and he had done more than enough in the game. he started and played center in 8 games, completing 3 of those games, appearing in 9 total. he was part of a defensive switch in 6 games, moving from center to left in 5 games and moving from left to center in 1 game. 2 innings with no official at bats in 1 game. 2 innings with 1 official at bat in 1 game. he started and was the DH for 4 games. he missed 6 games because of his lower back strain. he got 1 game off, though it was debatable that it was because his lower back strain had been acting up. Michael bat 3rd in 43 games. Michael was the DH in 4 games. Michael played in 38 complete games. i will not be adding Michael's game-by-game lines here; instead i will wait until the end of the season and group them all together. if you would like to see his game-by-game numbers and notes by the month, however, please refer back to my Brantley's April 2015 #s blog and Brantley's May 2015 #s blog. i hope you all enjoyed this new blog and i'll see you next month with another recap of Michael's overall numbers so far!